← Calling out Congressman Paul Henry was one tactic in the resistance to US Policy in Central America in the 1980s. This article is part of a larger research project on local organizing against the US war in Vietnam. Like in most US cities, Grand Rapids was active in the larger movement agains the US war in Vietnam throughout the later half of the 1960s and early 1970s. The anti-war movement in Grand Rapids was not as militant as in cities like Chicago, New York or Washington, but there were a significant number of people opposing the war in a variety of ways. The local chapter of the Women’s International League for Peace & Freedom, along with the Grand Rapids Quakers organized an ongoing vigil in downtown between the City and County buildings. Numerous churches took a stand against the US firebombing of villages in South Vietnam, with Fountain Street Church and Park Congregational leading the way. Both Fountain Street and Park hosted forums, provided information on how to resist the draft and brought in national speakers and musicians against the war such as Tom Hayden, Joan Baez, Holly Near and Jane Fonda. Many people were involved in the anti-draft movement in Grand Rapids as well. We interviewed Jashu Milanowski recently who was one of the anti-draft organizers that was living in an alternative community house on Charles St. Milanowski told us they were training people on how to file as conscientious objectors, draft resister and were part of the network assisting young men who chose to engage in self-exile and move to Canada. Many people from the Grand Rapids area also traveled to Washington, DC for the massive anti-war rallies. Many of those who went and organized buses were from colleges and high schools in the area, with Calvin College and Grand Valley State College being the most active. Grand Valley had a lively student anti-war contingent, holding Teach-Ins, rallies and anti-draft actions. Here is a picture of some students protesting the war just before a march on campus took place. In addition to student activism, Grand Valley had numerous faculty actively opposed to the war, but the highest profile on campus was that of Arend Lubbers, President at Grand Valley State College at the time. Lubbers was often a speaker at the student anti-war rallies on the Allendale campus. Anti-Vietnam War organizing was also substantial on the campus of Calvin College. Despite the conservative nature of the Christian Reformed college, Calvin students and faculty organized numerous activities for several years during the US war in Southeast Asia. 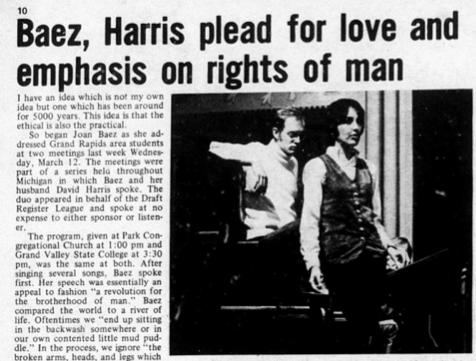 According to archives of the student paper, The Chimes, Calvin students and faculty hosted numerous lectures, debates and forums on the war, with an emphasis on Christian moral responsibility. 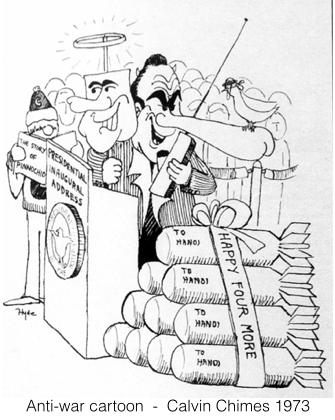 In March of 1968, forty seven Calvin Professors ran an anti-war ad in the Grand Rapids Press. 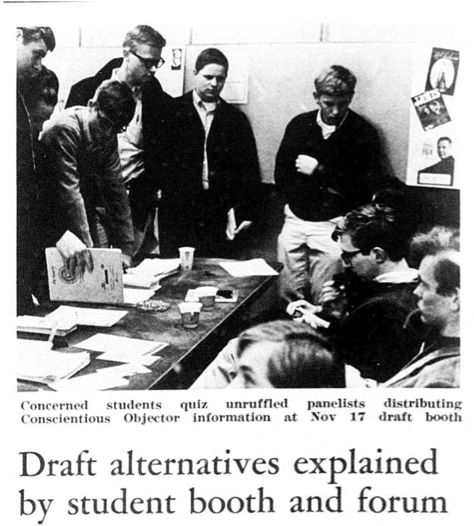 Students organizing against the war were involved in organizing Teach-Ins, rallies and informational resources for students on the draft, as is seen in the picture. 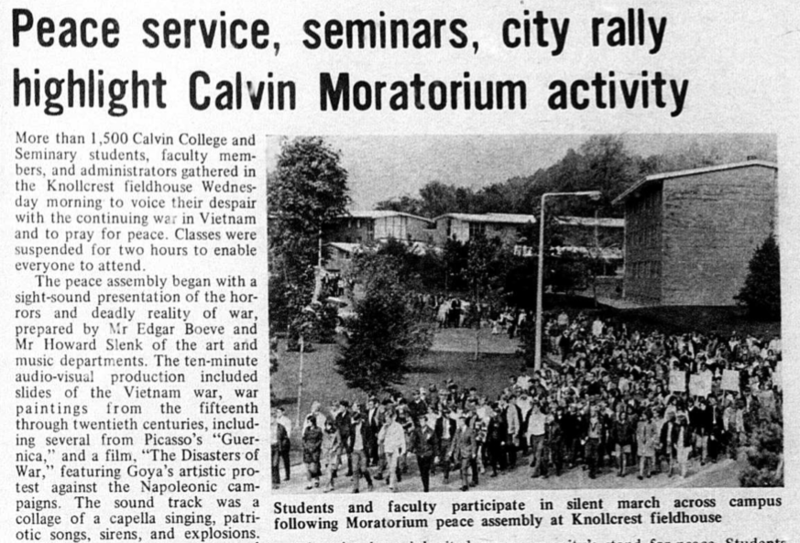 In addition, students at Calvin participated in the national Moratorium Campaign against the Vietnam War, with rallies on campus and organizing buses to DC. Lastly, it is worth mentioning that while there was no active GI-led anti-war movement in Grand Rapids, there were several veterans who have told us of their involvement in the anti-war GI newspaper movement. This is just a snapshot of the kind of anti-war organizing that was taking place in Grand Rapids during the late 1960s and early 1970s. We hope to bring you a more detailed investigation as we begin to research this issue for the Grand Rapids People’s History Project. This entry was posted in Vietnam War Resistance. Bookmark the permalink.